A wise man once told me, everyone wants a job writing about sports online until it comes time to write about sports online. Sportswriting never stops. It's a 24-hour, 365-day adventure that has folks scrambling to publish online words to hordes of ravenous fans anxiously awaiting the content to devour. And as a result of the demand, it's become easier and more common to publish instant, unedited and unfiltered takes to the masses. The results are sometimes a spectacular disaster. And once a year, we like to collect those disasters to serve as a reminder that we can always be better next year. I want to make this crystal clear: I live in glassiest of houses. This is not an opportunity to bomb on others so that I feel better about my own failures or horrible opinions. We're all in this together. You're going to read some terrible takes and egregious mistakes, but I promise I'm at the top of the list. 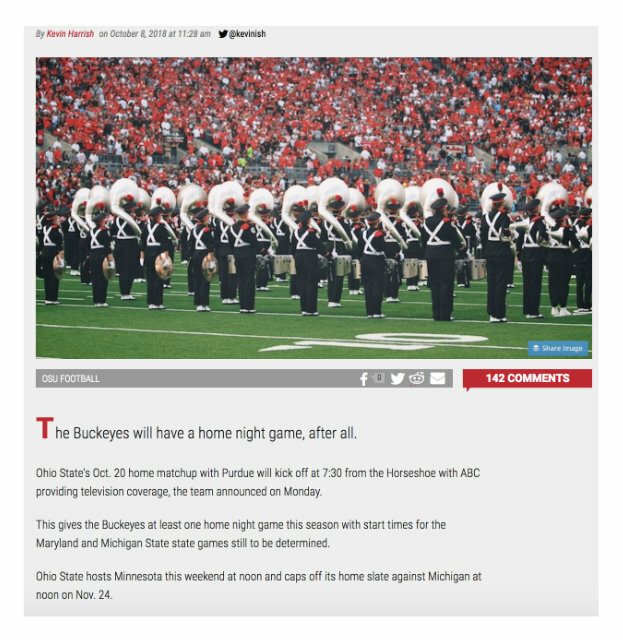 This year, I published an article stating that Ohio State's matchup with Purdue would be a home night game (as you know, the game was in West Lafayette). I also erroneously alleged that Nebraska lost to a game to an FCS opponent this season, which they decidedly did not. And that's not even including my numerous misspellings, typos and uncompleted sentences you have come to know. The point is, nobody is topping my transgressions, but that doesn't mean they didn't try! 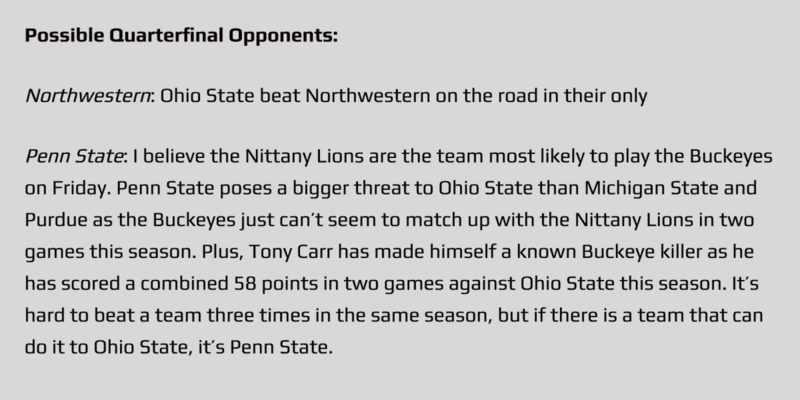 The Blue Jackets blew a 2-0 lead that night, and days later, Ohio State carpet bombed the top defense in the country. Of course he knew. He knew he was an alcoholic, he knew his marriage was in shambles and he knew that his mentor's grandson was a terrible football coach and that he was protected because of bloodline. Literally everybody knew. I knew. I wrote around it for six years. Look, *I* knew what Ramzy meant by this Tweet, and he clarified a few Tweets down, but I cringed as soon as I saw it because I knew many others would not. I was right. I'm glad Urban is gone. He harbored an unqualified serial abuser for years simply because he was the grandson of a mediocre coach who once gave him a job in the 1980s. The opinion itself is abysmal, but even if you're going to have a bad opinion, pick your timing a little better. I know the goal was to be edgy and piss people off, but the Internet doesn't need your help to be angry and miserable. Just sit this one out. His argument included things like length of game, jersey number rules, and overtime format and he never once successfully argued that the NFL was strategically superior. In fact, he more or less did the opposite. 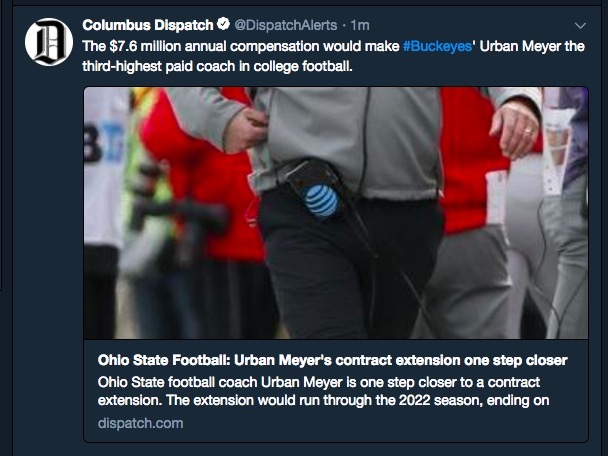 This take looks even worse months later, when the only reason Ohio State has the head coach they do is because they paid him over $1 million to be a coordinator this season. Also, by definition, they're "worth" what someone will pay for them. That's how economics works. NBA trade deadline and free agency is better than actual college football and NFL games. Tim, my guy, there's a reason why the simple "retweet" button exists. "How can we make this historic moment about us?" First half stats looking good. Despite the defensive attention paid to Kelsey Mitchell, she ended up having a solid first half. 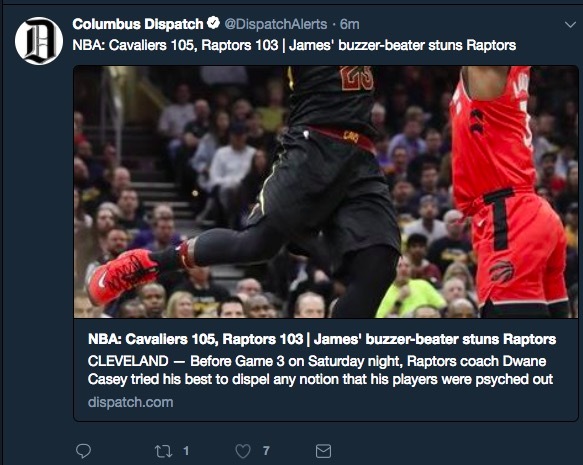 I get that not every outlet has the same resources, but the game was in Columbus, not across the country. You have a staff of 17 people but can't have someone cover a home NCAA Tournament game in person, and have to solicit the livestats password through Twitter DMs? I'm a documented skyline lover, but nothing about that photograph screams #yum. "My unpopular take is objectively correct, and the only reason you wouldn't agree with me is because it's too nuanced for you to understand." "How sad" is literally the most condescending way to express sorrow in the history of words. But don't worry, the article is FREE! This whole week was rough on their Twitter feed. They were blocking out some Ms in some Tweets but there was absolutely no consistency. Whatever the narrative was on Coach O, probably time to reevaluate. Deserves loads of credit for rebounding after Troy and -- to this point -- developing a qb. Uh, Joe Burrow was at LSU for three months before his first start. I think the wrong dude is getting the credit there. With the number of times Ohio State's played in the Rose Bowl, you'd think they'd know the primary color correct. Is... Is the former walk-on Ohio State receiver who most recently coached at a fake high school trying to angle for an assistant coaching job? Cause that's what it looks like. "I have never once watched the offensive line!" The live broadcast is about 15 seconds behind what we're seeing live. So, in advance: SPOILER ALERTS. This year, Adam Jardy learned that live TV is on a delay. I'm not convinced the Dean actually knows how to delete Tweets because there's just no reason for those to still be active. 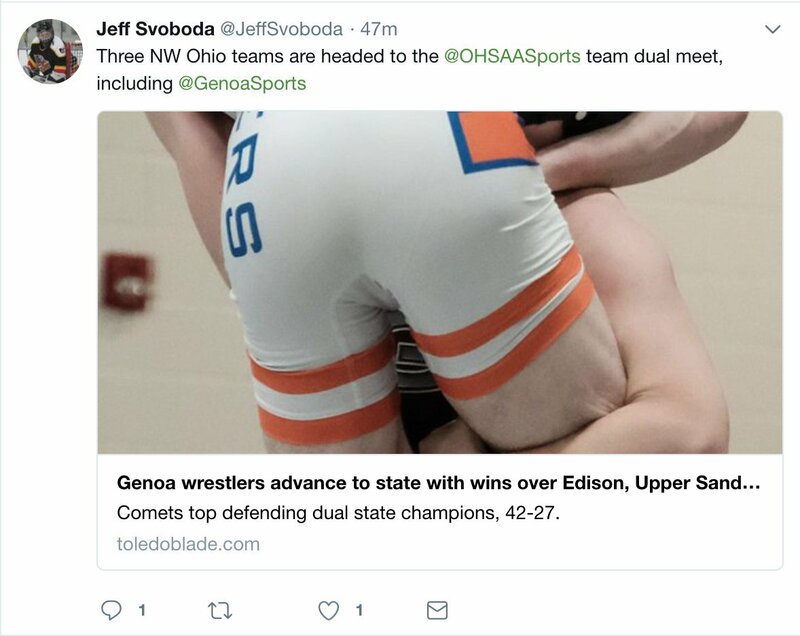 And speaking of things that are still active, when this was published, this six-month old article from Lettermen Row still had "general pubic" written instead of general public. I've made worse mistakes, but luckily I have y'all to bomb on me before I even wake up and don't have to wait six months for someone to rip the bandaid. An 12-1 season with a Rose Bowel win would be a GREAT year for any program, and hell yeah itd be celebrated, but if youd prefer your favorite team play for a bronze medal then you shouldnt be a sports fan. 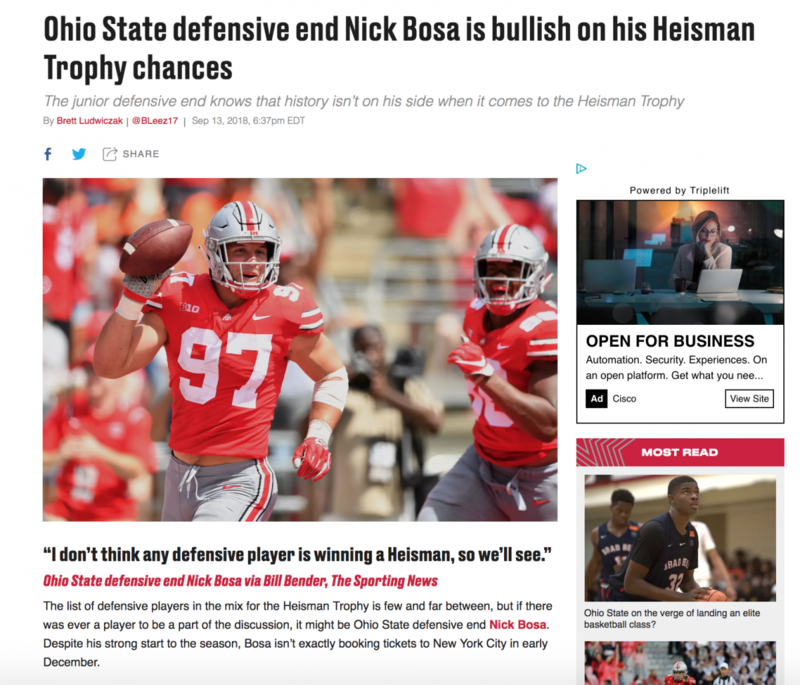 "Almost won the Heisman Trophy" doesn't scream "most under-rated player in Ohio State history" to me, but I guess we can go ahead and toss Dwayne Haskins in that category now! I mean, I'd watch the hell out of that. Justin Fields - transfer to #Pitt! You will be a star.. then take take over for Big Ben in 2 years for the #Steelers! Sounds like an awesome plan, my man! Mark May has no idea how the NFL Draft, works, does he? Ohio State has more than one defensive end, would they really be interested in adding Zach Harrison? Re: The John O'Neill crew. This isn't a one-game issue. This isn't a three-game issue. This is years of consistent, game-defining malpractice. This isn't just bad calls; their inability to manage personal fouls is the reason these games get out of control and players get hurt. Gun to my head, I could not tell you a single college football referee by name, but this dude can rattle off more than a dozen games a particular crew has officiated the past eight years. Steve get the hell out. I love how the fellow asks a very intricate, well thought-out scheme question and the response is more or less "Idk probably. Let the dogs go!" Everything in this was reported by other outlets like, a year and a half ago. I understand the contracts were finalized and you just got the records, but maybe let's pump the brakes on the self-congratulatory "exclusive." When did it become the industry standard to use atrocious stock photos? Cause we need to change that as soon as possible. This one is especially bad because it's not even a stock photo. 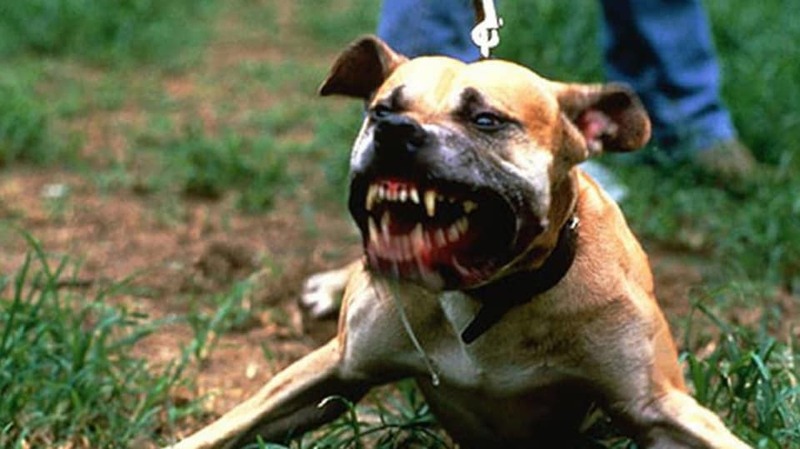 It appears they stole it from a Czech website, cropped out the leash, and doctored it to look more scary. Celebrate the win by helping us profit off of Dwayne Haskins' likeness with unlicensed memorabilia! They literally just stole our shirt design, and spelled "canceled" in the Queens English instead. Those are decidedly not what Ohio State wore. Its rather odd Ohio State would have Nike make and deliver throwback uniforms and commission retailers to create 1968 National Champions gear to then wear their standard home look. 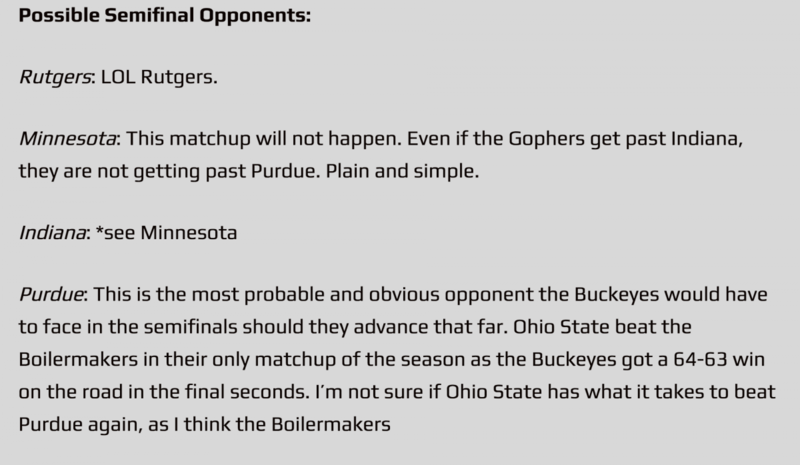 They had the abysmal #take that they didn't want Ohio State to go to the College Football Playoff and lose. And they were doubling, and tripling down. If that really was the best team in Michigan history, then wooooooooooof. The thing that annoys me is people displaying fake outrage over something so irrelevant to the cause. This fake outrage of being offended takes away from people who are trying to do the right thing and progress the awareness. Crying Woof! Urban Meyer said Isaiah Pryor can appeal his targeting call he received against Penn State. 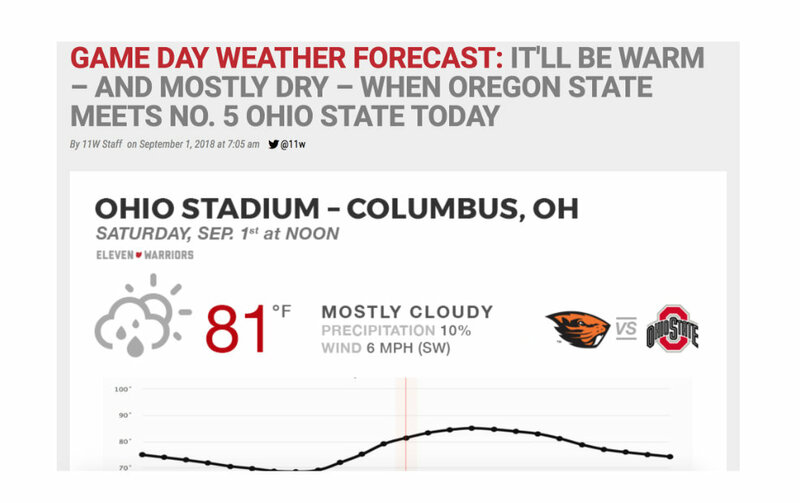 That was literally the direct opposite of what Urban Meyer said. "The story I wrote is an absolute must-read!" Maybe not the best time for a #GoBucks hashtag. If you read the comments, you'll see this was a predictably terrible idea. A headline, coupled with a sub-header, a quote, and a lede that directly contradict the headline. Looks like somebody doesn't know what the term "bullish" means. I get where he's coming from, but I could think of at least 20 players who would have helped this team more than Jeff Heuerman, especially in hindsight. Here comes the fourth quarter, which I saw little of because of deadline on Saturday night. Bold to admit that you barely watched the most important part of the game while you were writing a story about that game. Also, being on deadline is not a unique situation. Pretty much everyone in the press box is writing on some sort of deadline, and most have to publish something right as the clock hits zero. I don't even have commentary for this one. Create your own. Feigning concern to farm clicks using a photo taken of a television screen. What the hell even is Sports Illustrated in 2018? If Josh Gordon lands with an AFC North team or the Patriots or Jets I will drink bleach for 1,000 days. An entire section was "LOL Rutgers" and somehow it was better than the Purdue and Northwestern sections. Today is Urban Meyers first practice since serving month-long suspension. But dont expect any sightings. OSU media relations staff has asked that all reporters wait in a cramped hallway while the team exits the practice field. I promise it's no that bad. Hi, Wisconsin did not win the Big Ten. Block O, what are you doing? Maybe that's just a bit of a stretch. I think NFL scouts would beg to differ. Quotes to imply he's faking things. 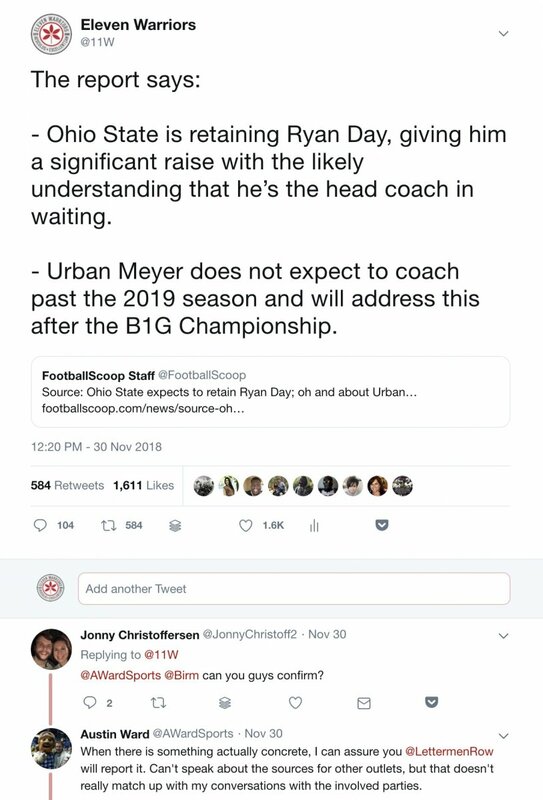 From a former member of the Ohio State beat. Show up in your suit and tie to a pro day and see how that goes. Imagine knowing that the guy that just engineered the 62-point offensive performance against you is now the head coach. 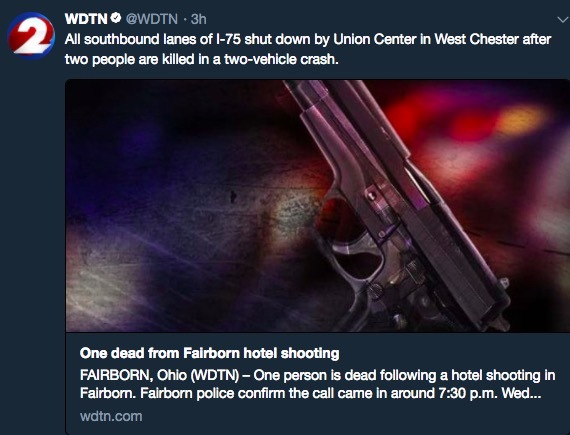 To Ohio State Buckeye fan who expects prospective NFL 1st rounder Dwayne Haskins to play for no pay in an exhibition game while risking financial security for life: How do you sleep at night? A new trend is to not only have opinions, but be absolutely aghast at someone having a differing one. "How do you sleep at night if you think differently than me?" And finally, this wouldn't be a collection of atrocious takes without Stephen A. Smith and Skip Bayless. Did I miss anything? The comments are open. And feel free to bomb on me – I ain't immune!